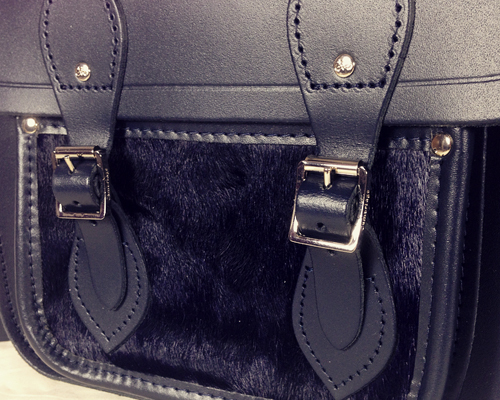 Remember when satchels were all the rage in the fashion world? Well, guess who forgot to arrive to the party! Don’t get me wrong, I absolutely love the look of satchels (particularly a certain Mulberry one) but I was extremely bored of seeing them absolutely everywhere when they were on trend so I refrained from purchasing one. Eventually satchels somewhat disappeared so I figured it was time to get one. Choosing the perfect colour proved to be a difficult task though. Pastel and white were out of the question as I’m a total stain magnet, neon hurts my eyes so I bypassed them completely and black just seemed too obvious so I was stuck. Eventually I settled on the 11” Haircalf Pocket Leather Satchel in navy. I ordered this Cambridge Satchel from John Lewis so I assumed like an absolute idiot that it would come beautifully packaged and would feel utterly luxurious. I was completely disappointed when I tore open the John Lewis packaging only to find the new bag sitting inside plastic wrapping. It actually made me feel like I had purchased a bag from Primark rather than one that cost 3 figures. Once I got over the initial disappointment I was rather overjoyed with the bag. It’s sturdy, well made and it does actually come with a dust bag but it’s hidden inside the satchel itself. The navy blue colour of it is absolutely perfect despite it being a fairly boring (it’s still more exciting than black though!) colour. The added details of the little bike logo on the hardware as well as the proper The Cambridge Satchel logo on the back of the bag make this satchel a little more special than your bog standard bag. I like brands that are subtle (which is why I absolutely detest Louis Vuitton bags) so a cheeky little logo here and there is right up my street. One thing I didn’t consider prior to purchasing this bag is how irritating it would be to open and close it. If you’re standing at the checkout in a store and are trying to dig out your purse from this bag you can guarantee you’re going to annoy a lot of people. It’s a little fiddly to open but, so long as you don’t need to access anything quickly, it’s all very cute. Some of the Cambridge Satchels come with a magnetic closure so fortunately this isn’t an issue that affects every single bag they offer. 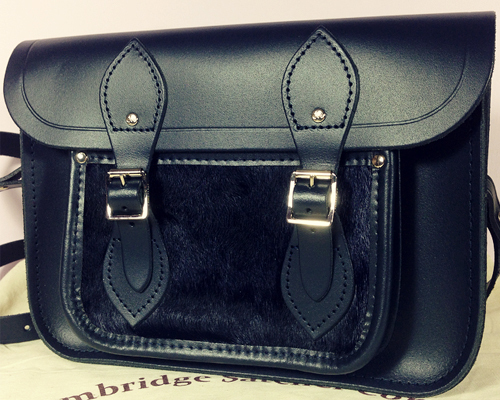 Overall I love this Cambridge satchel however, I’m not entirely sure it was worth the 3 figure price tag. Don’t get me wrong it’s a great bag but I feel like you can find similar quality in the likes of Topshop for a fraction of the price. I imagine the price reflects the fact these bags are handmade but if you’re in the market for a satchel and are on a tight budget I wouldn’t fall over yourself for a Cambridge Satchel. I’m happy with my pick but I do wish I shopped around a little more. Oh well, it’s pretty and functional, what more could I want? The idea of putting sea salt in my hair in order to clean it is a rather confusing concept to me. I have not so fond memories of swimming in the salty sea on holiday before ripping out half of my hair thanks to the tangles the water left behind. 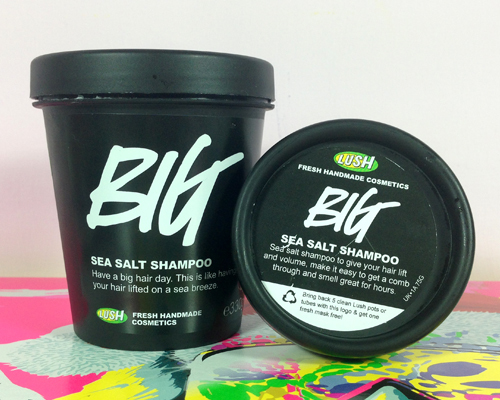 As a result of these memories I steered clear of Lush’s sea salt infused shampoo Big but eventually, curiosity got the better of me and I just had to use it. 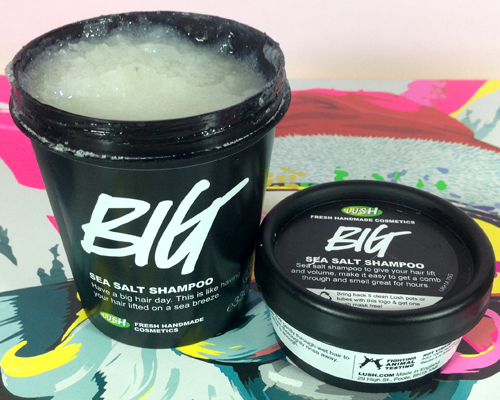 As Big is packed full of sea salt I really did not expect it to lather up or even clean my hair. I thought my expectations were proven right upon my first use of it when the shampoo failed to lather. As I always wash my hair twice during each shower I decided to grab some more of the gritty goo and slathered it all over my head. My original thoughts were completely destroyed by all of the suds that appeared. It turns out a 2p sized amount is much better than a 5p sized blob. Who’d have thought it? When it comes to the whole combing and drying side of things I’m always left pleasantly surprised. I assume every time that my hair will be tangled up beyond repair but somehow my comb glides its way through my freshly washed hair. It’s also always extremely soft and somehow slightly shiny once I’ve finished styling it thanks to the seaweed and lemon and lime. The salt helps add volume which is something I haven’t been able to achieve in my hair in lord knows how long. The scent Big leaves behind is also rather delightful; it’s clean, fresh and oh so subtle. I have heard that Big can cause dyed hair to fade. 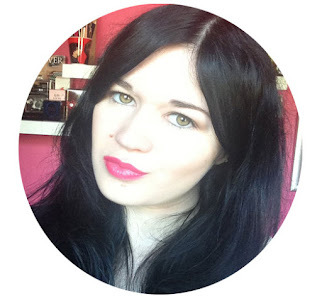 I have dyed black hair which is prone to fading as it is (thank you natural blonde hair!) but I’ve yet to notice any fading as a result of Big. My disgustingly large blonde roots were dyed a few days before I started using Big and they’re still as black as ever. Perhaps with more use my hair will fade but for now, everything is fine and dandy on the black chemical front. The only issue I have with Big is water can easily seep into the tub which makes the last scrape of the shampoo a little useless. Aside from the water ruining the last bit of the product this shampoo is incredible. I’ve already repurchased it and I think its shampoo love. Do you think it’s too early to propose? 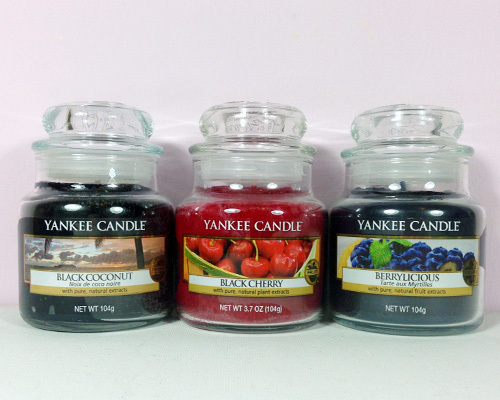 After using up my entire Yankee Christmas Cookie candle I decided I needed a new scent so naturally, I purchased 3. In my defence, I wasn’t really planning on stopping myself at just one candle. I don’t even attempt to bring willpower to the game anymore. As winter seems to have returned again after a week of sun and slightly above freezing temperatures I decided I wanted a candle that was a little more tropical. 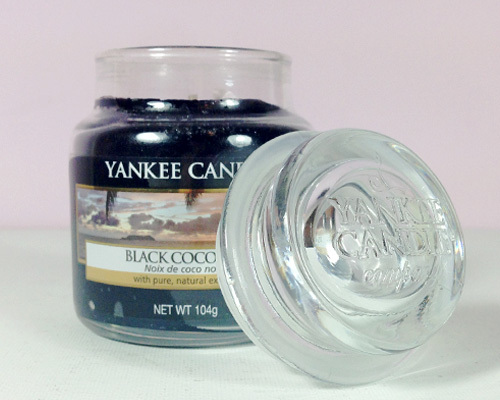 As soon as I got a whiff of Black Coconut in the store I knew I had to have it. It’s funnily enough a coconut scented candle that smells delicious in the jar but not so much when it’s burning. Annoyingly it doesn’t give off a very strong scent so my dreams of being reminded of beaches and palm trees by Black Coconut have been ruined. The flame also reaches heights it shouldn’t even after various trims of the wick. 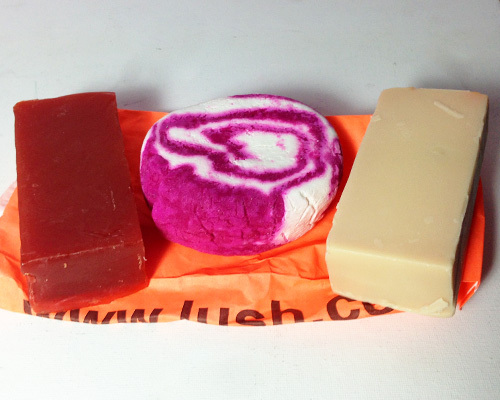 Berrylicious was purchased as it went with the scent of Lush The Comforter bubble bar perfectly. 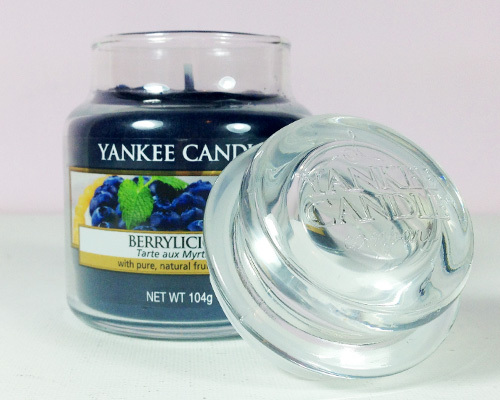 It’s a gorgeous, fruity scent that completely fills the room with its berry goodness. This is a sweet scent but it’s also very warm and inviting. If you ever use The Comforter bubble bar you need to burn Berrylicious with it. 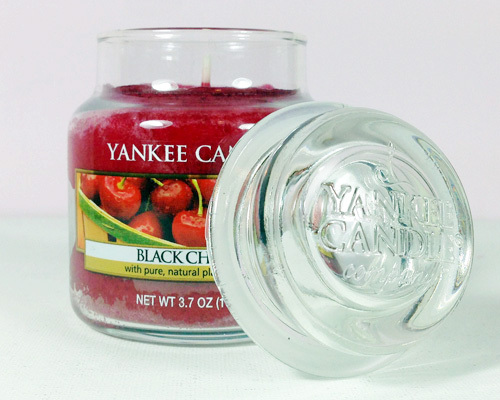 Black Cherry was purchased as I wanted another fruity scent. This is a fairly genetic candle that is completely overpowered when burned alongside Berrylicious but dear god is it lovely! Black Cherry drips sugary goodness and makes me crave Cherry Drops (can you still buy them?) like there’s no tomorrow. It’s a great candle to burn on cold, wintery nights but it can become a little sickly if you burn it for too long. So there we have my little Yankee candle haul. I didn't even plan on buying any of these, I just sort of stumbled into the Yankee candle store and decided right there and then I needed to replace Christmas Cookie. Why must Yankee candle stores be in shopping centres? Just take my money! Valentine’s Day has never been a big deal for me. 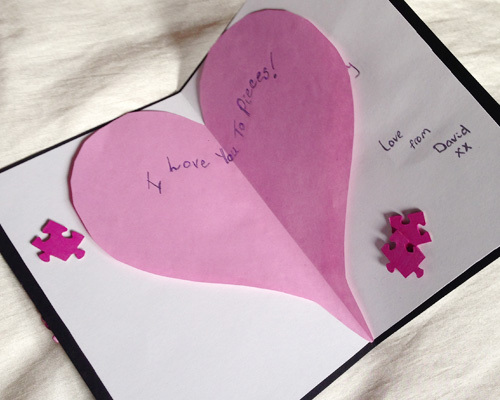 I think the last time I celebrated it was in primary school when we were all forced into making cards and awkwardly handing them to the people we sort of liked. 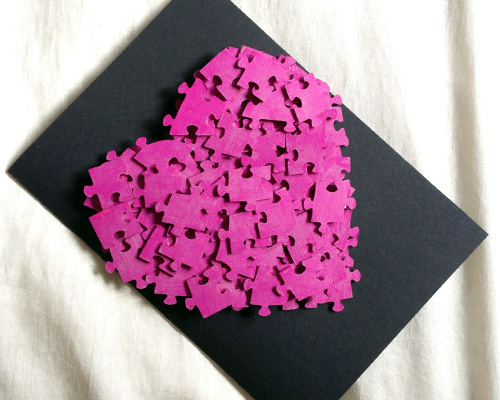 I haven’t bothered with it since becoming a grown up (ha) but for my birthday this year my other half booked us a hotel and spa break conveniently on Valentine’s Day so, for one night only, I followed the masses and decided to be all cute and loved up. Cue the sickening “aww”. We started the day off by giving each other cards. Mine involved a reference to bums (I got it on Etsy) and his involved his own handiwork - I’m adamant he planned on one upping me the whole way through Valentine’s Day. He gave me a gorgeous handmade card with an adorable pun inside. And he says he’s not creative! The next stage in our day was to drive through to Edinburgh where we would be staying for the night. The original plan was to let me drive but as I apparently have severe road rage it wasn’t allowed so off we went with my other half behind the wheel. We ended up at Tony Macaroni for lunch where I conveniently forgot I was a vegetarian and had a cheeseburger. Whoops! The next part of our day was to go to the Scottish National Portrait Gallery but, just like last weekend, we timed it rather badly so we went straight to the hotel instead. 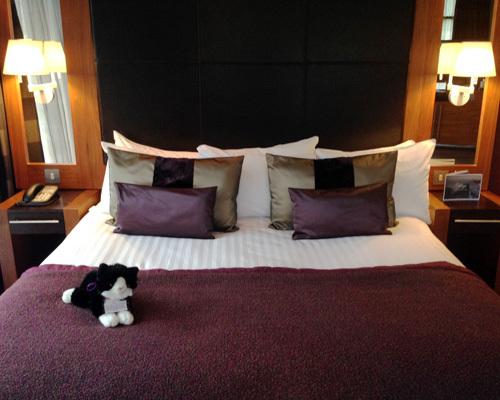 My other half had booked us a night at the Norton House Hotel with spa treatments. We were staying in the Edinburgh suite which came complete with a huge balcony, a TV in the bathroom and only one other room on the same floor. What more could you want? Our spa treatments occurred shortly after we checked in. The first treatment was a Rasul treatment which involved being put in a steam/wet chamber and smearing clay all over ourselves. I wasn’t sure what to expect from this treatment but dear god it was fabulous. The heat did worry me at first mainly as I hadn’t had any water that day and am subject to dehydration on a regular basis; fortunately everything was all good in the hood on that front. Our second treatment was a massage and it couldn’t have come at a better time. I’d been stressed and tense for a good few weeks so having someone massage me was utter bliss. Things did get rather painful towards my shoulders but they feel amazing now so I’m glad I didn’t ask the masseuse to stop. I think I might make massages a regular occurrence now. The meal came a few hours after our spa treatments and if I’m perfectly honest I was dreading it. As previously stated I’m a vegetarian and we were eating in the fanciest of fancy restaurants whose Valentine’s Day sample menu consisted mostly of meat dishes. 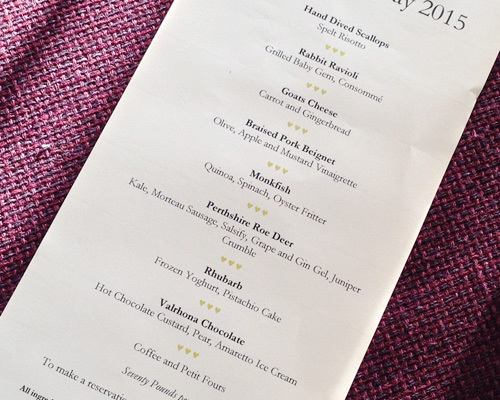 I think it’s safe to say I’m not the strictest of vegetarians so I decided to give each course a try. I somehow ended up eating rabbit, deer, steak (we asked to skip the monkfish and were kindly provided with steak in its place) and pork. Admittedly everything was rather tasty but I’ve never been a huge meat eater hence the vegetarianism. Eating rabbit after having pet rabbits as a child seemed a little sinister too. I will say though that the desserts were to die for! I’m just gutted I didn’t have enough room for the entire chocolate one. We decided to skip out on the coffee and carried our massive stomachs to our room. Our night ended with a slide about in the bath as we were absolute idiots and didn’t bother using the bath mat provided. Common sense tends to leave us after 11pm. 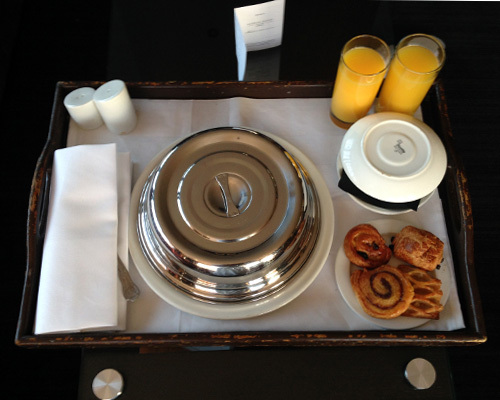 As breakfast was destined to be mobbed we ordered room service. 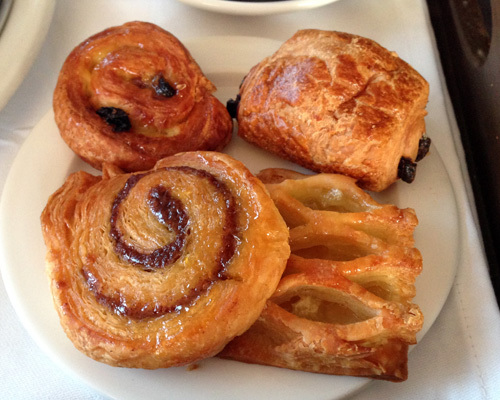 My other half went all out with porridge like an old man and a fully cooked breakfast while I decided to treat myself to a selection of pastries. Breakfast in the most comfortable bed imaginable was the perfect way to end our weekend. 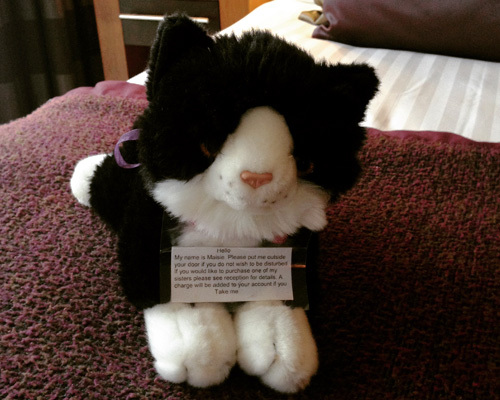 We were both rather gutted to be leaving the hotel but alas, our stay had to end sometime. It’s safe to say my significant other got me an incredible present and I would happily relive it all again. Annoyingly I now have to think of an amazing present for my male human’s 24th birthday. Maybe I’ll buy him a robot butler or something. Help! As I’m going away for the weekend I figured it would be the perfect time to do a “What’ in My Travel Make Up Bag?” post. Is this type of post even popular anymore? Oh what does it matter? Nothing about me has ever been popular! I’ve had this beat up Clinique bag for years now and despite it being very small, it fits everything I need. Who needs a giant bag when you can fit everything into a tiny little thing you received free from a magazine when you were 14? Let's ignore the fact I've taken these pictures over a giant Santa! 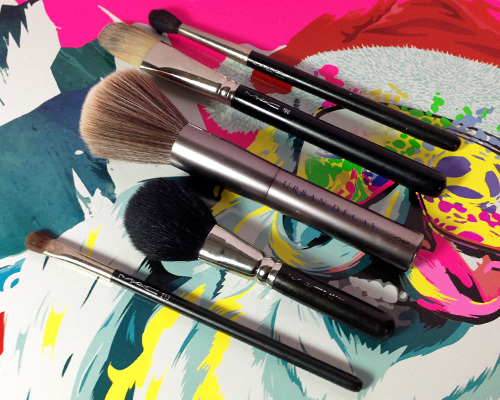 First up are the boring things, brushes! I will be carrying my Urban Decay Good Karma Powder brush, MAC 190 foundation brush, MAC 129SH blush brush, MAC 224 blending brush and MAC 213 eyeshadow brush. These are my typical brushes so there’s nothing all that new and exciting to see here. Now for the things that begin to make me look human. I typically use Bobbi Brown gel eyeliner but as that requires an extra brush I switch over to my trusty Rimmel London eyeliner for travelling. This was the first make up item I ever bought and it’s an eyeliner I trust. Yes, I trust an eyeliner; we tell each other secrets and brush each other’s hair. Wait, where was I? 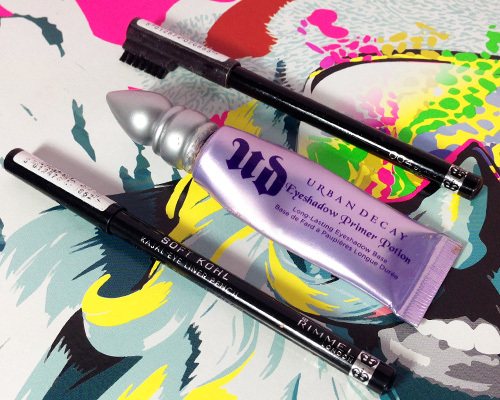 Urban Decay Primer Potion is also another trusted make up product of mine and I never apply eyeshadow without it. As for the Rimmel London eyebrow pencil, it’s a little pointless as it doesn’t do much to my eyebrows but I feel rather odd if I don’t apply it. My eyebrows get upset if they’re not prodded with a pencil. For my base I have to have 4 products, if I had a tan it would only be 3, damn Scotland! 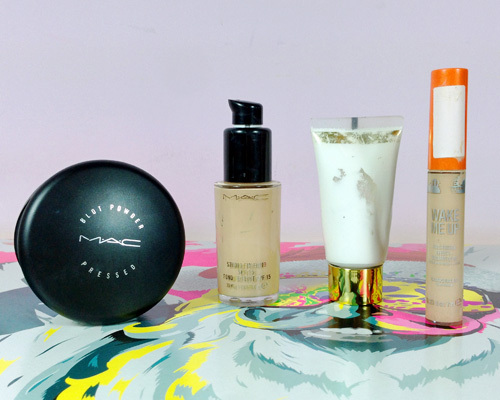 My foundation is a mix of MAC Studio Fix Fluid (which is in the lightest shade possible and is still way to dark) and Barry M white foundation which annoyingly has been discontinued. My concealer is the ever brilliant yet constantly leaking out of the tube Rimmel London Wake Me Up concealer. 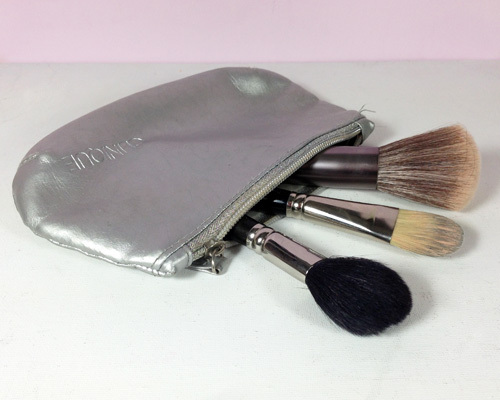 To set my base I apply a quick sweep of MAC Blot Powder. Finally we’re on to the more fun things in my small silver bag. 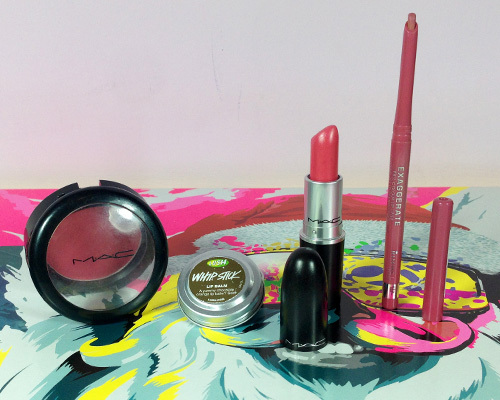 The blusher I plan on rocking this weekend is MAC Dollymix. It’s a little dark for my skin so it requires some serious blending but, once it’s all blended in, it looks utterly fabulous. 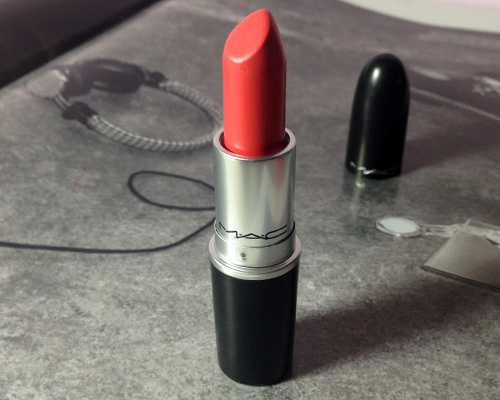 My lipstick will be MAC Chatterbox (I was going to be boring and go for red for Valentine’s Day but then my other half would refuse to come near me) and my lipliner is Rimmel London lipliner in East End Snob. This will be layered over Lush Whip Stick which is hardly fun but it smells like chocolate. 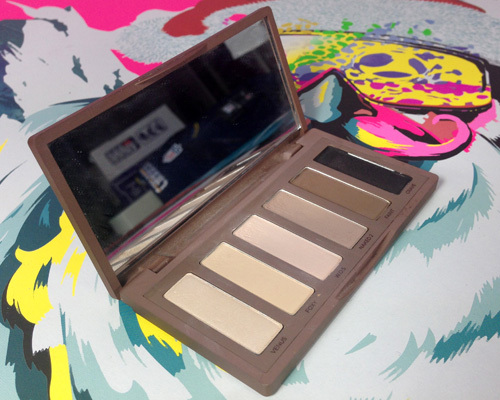 Last but least is the world’s greatest tiny palette and that’s the Urban Decay Naked Basics palette. There’s 6 gorgeous neutral eyeshadows in this palette so I’m set for whatever eye look I wish to create. I can also put black eyeshadow all over my other half while he sleeps so it’s a total win win situation. So there are all of the things I will be slapping on my face for Valentine’s Day. I’ll be eating in a rather fancy restaurant so knowing my luck I will apply my make up like a clown and my significant other will be embarrassed to be seen with me. Woohoo for Valentine’s Day! A few days ago I decided it was time to finally spend the Lush gift card that was burning a hole in my purse. I probably went a little overboard but hey, I was spending someone else’s money (thank you to my adorable other half for that) so I’m not complaining. I originally planned on going through each product one by one but that would have resulted in an essay length post so, due to my short attention span, I am refraining from doing such a thing. The majority of these products will no doubt be reviewed in the near future. 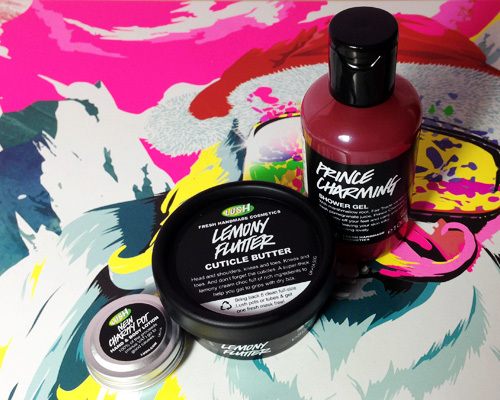 I’m going to end up with a blog dedicated entirely to Lush at this rate. Anyway, I shall give you a brief overview of each product and will try to keep this post below 1000 words while doing so. 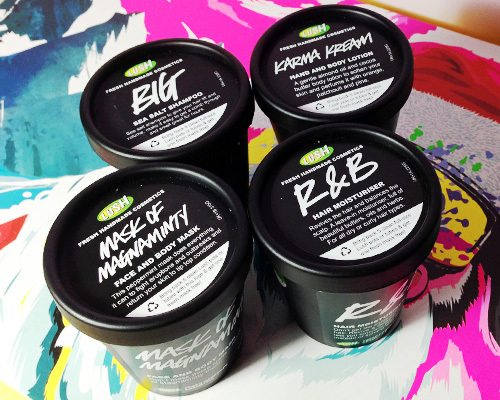 R&B, Big, Mask of Magnaminty and Karma Cream were purchased based on very quick decisions. I’ve only just started to use Big thanks to receiving a tub for Christmas and I’m beyond happy with it so a bigger tub was necessary. 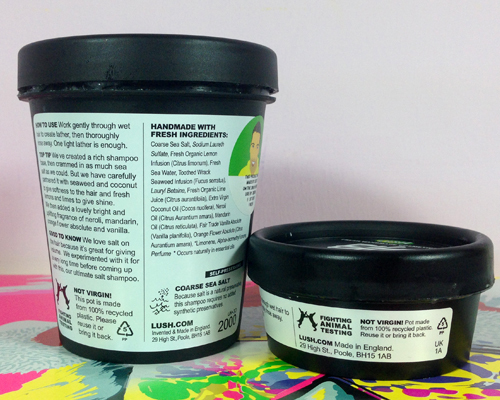 The other 3 tubs were just happy little treats for my skin and hair. I missed out on Prince Charming last year so I knew fine well I had to get my hands on it this time around. I left it rather late but 6 days before Valentine’s Day isn’t too bad right? The other 2 items in the above picture were last minute decisions. Charity Pot is something I always end up getting because I’m nice like that and Lemony Flutter smells good. Simple things eh? Now for the smelliest of the products! The Comforter is a bubble bar which needs a bath in order for it to work; I currently do not have a bath in my house but the hotel I’m staying at for Valentine’s Day does. Weirdly it wasn’t even my idea to buy this. How did that happen? I also picked up 2 soaps for my dad as he’s a Lush soap fiend. The majority of soaps that were cut up and ready to go were on the larger side of things so I went for the pre packed soap. Karma and Honey I Washed The Kids feature in this pack and fortunately for my dad, he likes them both. He’s awfully specific when it comes to soap, what a weird male. I think it’s safe to say I was very generous to myself. More people should give me Lush gift cards, yo people, where you at? Since the age of 4 I’ve wanted a dog. I used to beg my parents every single day for a puppy and they never ever caved. My brother and I were lucky enough to have had 4 rabbits during our childhood (some of which I took for walks like a dog) as well as hamsters but never a dog. 18 years later my parents decided that it was time we got a little friend with 4 legs only there was a twist…intrigued yet? 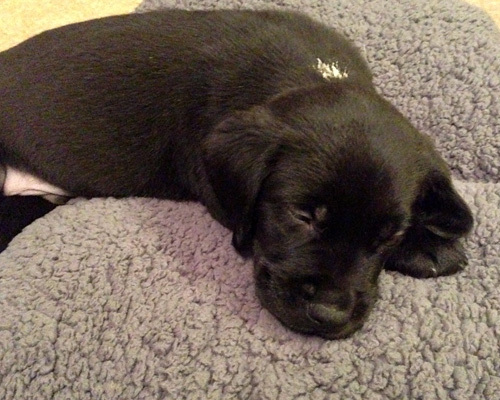 Teddy came to live with us on January 27th at the tender age of 9 weeks. 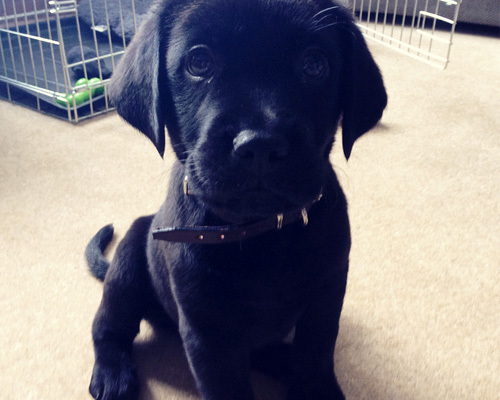 He’s a black Labrador-Retriever cross and is currently training to become a Guide Dog. Yep, there’s the twist! 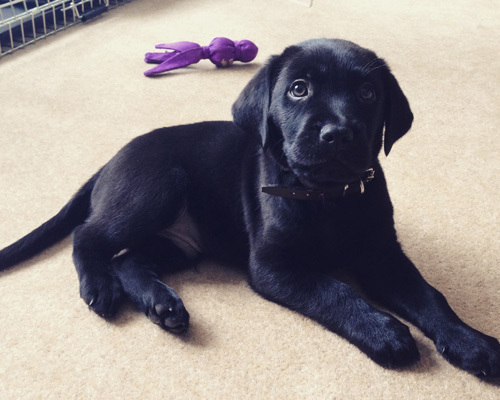 We’re only going to have Teddy for around 12 – 14 months; after this period he’ll go off for the final stages of Guide Dog training and then will hopefully be guiding someone through life. It’s a little heart-breaking to know that one day he’ll be leaving us but it’s also rather amazing to know that he may be a huge asset to someone one day. As he’s training to be a Guide Dog we have to be quite strict with him. He’s allowed playtime and to just be a puppy but at the end of the day he’s a working dog and things have to unfortunately be a little tough for him. Throwing a ball for him is a big no no and he has to do certain things like doing his business on command and walking on the correct side of you. It's all very random. 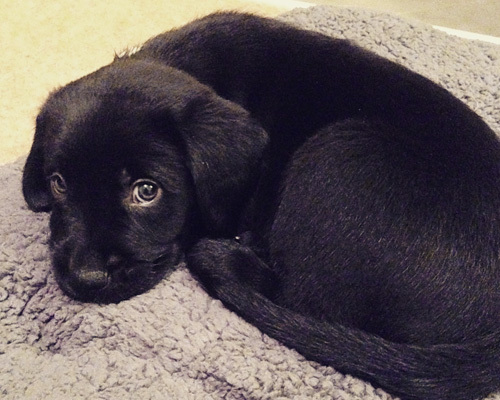 It’s a little weird due to the fact I keep thinking of him as just a little puppy so I have to be hard on myself and ensure I don’t do anything to mess up his chances at becoming a Guide Dog. Can you say pressure?! There is a possibility that he might not make it as a Guide Dog but if that does happen there are plenty of options for Teddy. He’s definitely a quick learner (although he doesn’t quite understand it when I tell him not to headbutt my bum when I’m trying to give him food) so I’m sure he’s going to be suitable for something whether it’s being a Guide Dog, a Dog for the Disabled or any of the other things he tries out for. Needless to say I think we’re all going to be rather sad the day Teddy leaves us but at the end of the day, this was the deal and we’ll hopefully play a role in making the life of a blind person a little bit easier. I’m just going to enjoy Teddy’s small head and waggy tail until that day comes. “Spring” was the first thought that popped into my head as I left my house this morning, “freezing” is what came to mind later on as I hurriedly made my way to my car after leaving work. Apparently Spring is still a long way away made even more apparent by the fact this is my January Favourites post. The snow falling from the sky doesn’t help matters either. Dear god I need some warmth! Anyway let’s get into this shizz! I have no idea if this palette actually has a name but look at how pretty it is! I was obsessed with this palette for the first few months I had it but then I got the Urban Decay Naked 3 palette and forgot about every eyeshadow I own. I rediscovered it in January and now I can’t stop using it. I do tend to use the more neutral shades and the incredible black eyeliner but the mere thought of the bright eyeshadows and various eyeliners and lipglosses makes me rather happy. Simple things. The colour may not suit me and the formula may be a little too creamy for my liking but I’ve been obsessed with this lipstick for all of January. I didn’t really sell it all that well in that first line did I? 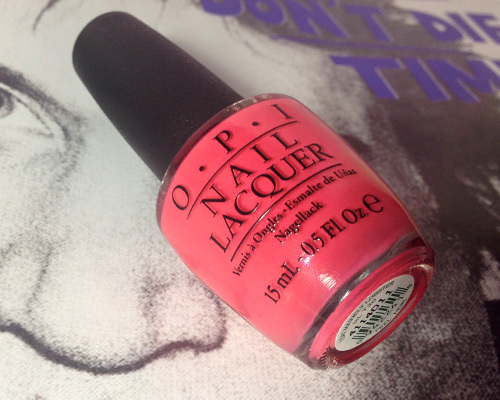 What can I say other than it’s a summery shade that makes me crave warm weather, blazing sunshine and skin that burns despite having a whole bottle of sun cream on it. Oh hey miracle worker for dry hair! My hair goes through stages of looking okay to then looking and feeling like crap and right now it’s definitely doing the latter. 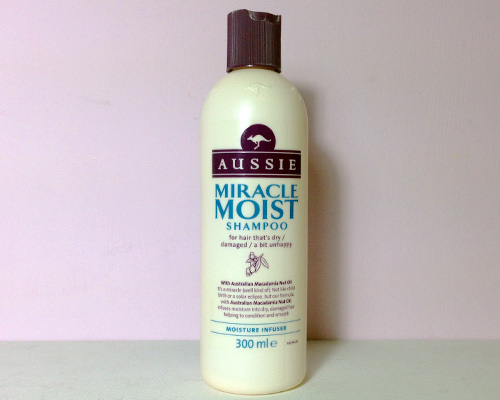 Fortunately Aussie Miracle Moist shampoo has been assisting in the dry department so my hair doesn’t feel completely atrocious to touch. I’m about to run out of this shampoo so I think a repurchase is in order. Ah yes the coral nail polish to go with the coral lipstick. I Eat Mainely Lobster is such a gorgeous shade I often question myself whenever I remove the severely chipped remains of it from my nails (can you tell I keep my nail polish on for too long?). Like Vegas Volt it reminds me of Summer and I can’t wait to rock this under the sun! Please excuse the not so great photo and the white nail polish on his back. I'll explain all of that in another post. This little bundle of joy has been with me for a week now and I think I love him. I’ve told him I love him but he hasn’t said it back, what a slap in the face! His name is Teddy and he has the tiniest head. I really cannot write like a normal person about my little puppy because he’s so asdfghjklcute! So there's my January Favourites. I probably finished this post just in time as a certain small little puppy wants to play/eat my socks.